My guess is the Padres liked Franco best when it looked like the Phillies were allegedly ready to play Santana or at least Crawford at 3B and they could get him cheap. But that was a long time ago. And right now they themselves could sign Moustakas or even Marwin Gonzalez, to say nothing of Machado. I still tend to agree Machado remains their first choice (not sure there's anything at all to the crazy rumors, any more than the last time someone posted that fake Twitter account here, or the last time the story about the game came up, or the time Greg Luzinski tweeted it was done). And if they do sign Harper Franco is acceptable (and no worse than Kingery to say the least). But who knows what Moustakas might actually cost. And it is true Boras might be happy to put him here if Bryce is here too. I have really cooled on Manny. I am more and more inclined to see a Harper-Moustakiis double signing. That would add 2 power LH bats to balance Hoskins & McCutcheon as RH bats. Look at all the extra HR's he would have had at CBP vs Nationals Park. I don't really see the need for another left-handed bat since we will also have Herrera/Quinn/Williams in the lineup as well as Hernandez who is a switch hitter. In my youth I had to live with the anguish of my favorite team the Tigers facing the Yankees M&M boys. Imagine the youngsters now dreading the Phillies and the H&H boys! Moustakis has 30 HR power. He is a completely different hitter than Herrera or Quinn Moose could bat 5th behind Hoskins. So you would have Harper (LH), Hoskins (RH) Moose (LH) McCutcheon (RH), Herrera (LH), Alfaro (RH). Well, the one thing Franco does have is 30-HR power. But only if he can maintain last year's level of performance. I would not begin to guess how this ends. The focus was on Manny for so long. It was assumed Harper would be harder to sign, maybe not even available. Now I think the focus on him is probably out of proportion just because it turns out he's gettable. Player vs. player I still prefer Machado (plus no draft pick). If I owned an entertainment company I'd probably prefer Harper. If we sign Harper, we'll need to have extra outfielders at the ready to fill in during the several weeks of the season he misses on average with injuries. Williams, Quinn, and Altherr would all be reserves under that scenario. Cozens too. We likely trade an OF if we sign Harper even with his injury history. Only room for 4-5 on a 25 man roster and a couple more on the 40. Most of the extra 15 players on the 40-man roster will be pitchers. Yeah I don't see how Altherr actually sticks, even though he has some use (and even if they trade Williams). He's out of options right? But with a Quinn/Herrera/Harper/McCutchen OF, if Harper gets banged up that just means more playing time for Quinn or Herrera. Assuming Quinn himself isn't hurt obviously. Kingery the next OF option without a call-up. Altherr is useful as a reserve, though the extra right handed bat is not really needed with the current roster. If we added a Moustakas in addition to Harper it might create a little more room on the roster for a right-handed power bat in reserve. But if we sign Harper but keep Franco, that means we have lots of RH bats in the lineup (McCutchen, Hoskins, Segura, Franco, Altherr) and few people other than the pitcher that Altherr might hit for. The biggest reason to prefer Harper over Machado might be that he is left-handed and fits the lineup better. Altherr should be out of options. Quinn also. Williams has two more but really has not done anything to make the team want to demote him. Makes him a trade candidate if the bench is full. Quinn and Herrera also. If we don't sign Moustakas I kind of like keeping Williams on the bench to give us that second left-handed power bat. Moustakis had 30 HR power once, in his age 28 season. Through his age 26 season the most HR's in a season was 22, the same as Herrera in his age 26 season. Moustakis probably would hit 30+ HR with his home games in CBP next year but who's to say that Herrera won't? Also given Kapler's preference of hitting guys with higher OBA higher in the order I have my doubts if Moustakis would bat higher than McCutchen or Herrera often. I wouldn't be surprised to see McCutchen lead off sometimes and either he or Harper batting 2nd some games. McCutchen is definitely going to hit first or 2nd, just as Santana often did (39 times, but Cutch isn't going to hit 4th like Carlos did). Now that there's a bigger bat at SS I could see Hernandez dropping to the bottom of the order (especially when the pitcher hits 8th). I suspect you may be right, but I certainly hope not. The leadoff hitter should be the guy most likely to get on base, and on this team that is Hernandez, who has had a higher OBP than McCutcheon each of the last 3 years (it is fairly close). Hernandez and McCutcheon as 1/2 and then work out the rest is what I am hoping for, but we will see. Kapler has some genuinely odd ideas about a lineup, as shown last year by his handling of Kingery in prime hitting positions (despite significant evidence that he was one of the worst hitters in the league with an OPS+ of 61, but he hit 1-5 in 22 starts, which is way, way too many). 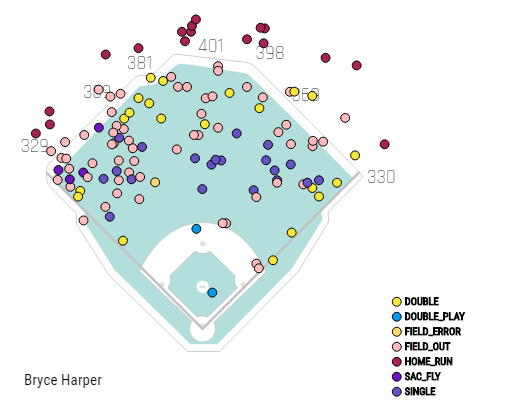 Harper has the highest OBP of anyone. I don't know if we really know anything about how Kapler likes a line-up. He worked with what he had and there were flaws up and down. Santana not hitting for power, Herrera's slump, Altherr being terrible, Hernandez's injury, Franco's underwhelming first half, not having a shortstop. And while most people agree you should give your best hitters the most ABs an unconventional manager is less likely to care whether a guy hits 5th or 7th. 22 starts doesn't sound like that many to me. So long as Cesar is back to his usual self I'm sure he'll get plenty of opportunities. Not much we can really say until we know who they've actually got. Also it would be really great if Herrera was good enough to hit 2nd or 3rd. Segura was a two-hitter and he'll probably be 7th in Philly. Rumors that Harper may be negotiating with Arizona...I don't really believe that since Boras needs to add teams to make the price go up. Agree with you. That's just kinda silly. The team that just lost Corbin and Pollock and traded Goldschmidt. Sometimes a manager makes decisions based not on analytics but psychology, what does it take to get a player out of a rut. I think that was the case with Kingery, trying to jump start him. Didn't work, but it explains some of Kapler's moves. Not sure if its silly but I think its about where things are right now. Boras and Lozano both are just waiting it out. As are the Phillies and White Sox. Other teams may come in do some due diligence and then drop out or not. There is no hard and fast deadline. I do think some of this is spread by the agents, but at the end of the day both Boras and Lozano know what their highest offers are, know where their players want to play. Harper meeting with the padres tomorrow.